DV 1280 Video spy pen looks like an ordinary pen, but it is quite sophisticated with a built-in video camcorder. DV 1280 Video spy pen can be used to take still pictures or make video and audio recording of your surrounding without being noticed. The DV 1280 Video spy pen a great security and surveillance gadget for law enforcement agents and private investigators. It is a spy gadget for everyone. The DV 1280 video pen features 2 megapixels camera, 8GB storage, and webcam feature. The DV 1280 is a pen with a difference. It looks sleek. It writes like a pen, but that is where the similarity ends. The difference is that the DV 1280 spy pen has a 2.0 megapixel camera/camcorder built-into its slim body. That is why it is called a video pen. That is also what makes it special and a lot useful than ordinary pen. DV 1280 spy pen can take still images as well as record video and audio of any surrounding. A push of the button is all you need to start recording. 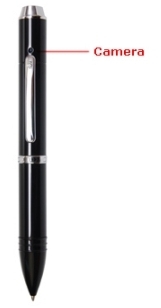 The DV 1280 Video spy pen also provides a switch for toggling between still picture and video. DV 1280 Video spy pen has lots of possible application. The most obvious being its potential as a spy gadget. The ability to record discussions and scenes without being noticed makes the DV 1280 video spy pen indispensible as a spy or surveillance gadget. Private investigators and law enforcement professionals will find the DV 1280 spy pen very useful in their work. However, the DV 1280 video spy pen is not just for private investigators or law enforcement; it can be used by anyone. Aside satisfying your fantasies from watching too many James Bond movies, the DV 1280 video spy pen, can be used for any video or audio recording. For example you can have audio and video recording of lectures, meetings, etc. DV 1280 spy pen can also function as a webcam, albeit an expensive one, but aggregating all the other features including that you can actually write with the pen, the DV 1280 video spy pen comes off as one of the best spy pen around. DV 1280 video spy pen features 8GB storage, enough space to up to 30,000 photos. 8GB is also enough to record several hours of video. The DV 1280 video spy pen can easily be connected to your computer via USB cable, there you can sync or backup your photos and videos. The price of the DV 1280 video spy pen from online spy shops ranges from $145 to $289, this converted to Naira is N21,000 to N43,000. We have no information about the availability of the DV 1280 spy pen in Nigeria. You can check a local spy, security, or surveillance shop for availability. Shopping malls are also a good place to look.